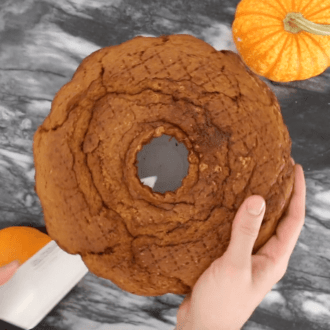 This show-stopping pumpkin bundt cake might look just like a real pumpkin but don’t forget, it tastes amazing too! A moist pumpkin cake loaded with all your favorite fall spices, filled with cream cheese frosting and enrobed in vanilla buttercream! It’s a bird, it’s a plane, it’s a giant pumpkin cake! OK first off I know many of you won’t have time to go all out and make an almost real looking pumpkin, but that’s OK! Just make the cake and serve with the glaze of your choice, slather it in cream cheese frosting, or eat it plain! If you want to go for added realism then whip up two batches of buttercream in similar shades of orange. Cover your pumpkin in one batch and begin shaping it. 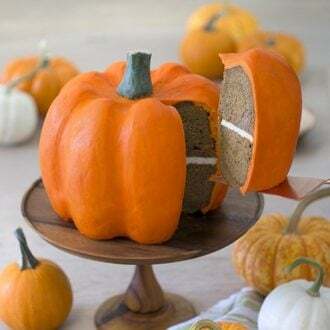 Pop the cake into the fridge and let it chill to harden, then add highlights or lowlights (your choice) on the pumpkin’s ridges and smooth them out to blend. The best shaping tool I can recommend is the back of a spoon, a yogurt container you cut into half circles and rounded points. These pieces will flex and give you better control when shaping and smoothing the pumpkins. Dipping your spoon into HOT water will help you smooth the chilled cake for a nicer surface. I have a couple of things to say about the stem. At first I tried to make one by covering an inverted cupcake in green buttercream and then sculpting. It looked OK but kind of cartoonish and out of proportion. I ended up mixing up a very thick batch of buttercream and rolling it into the desired shape then carved away at it, added some brown streaks and an off-white top. The result was significantly more realistic and easier to make. 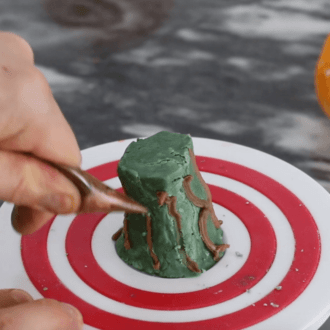 Your third option is to shape one from fondant, in which case you can totally go to town and make the most realistic but inedible pumpkin stem ever!. When you’re doing the final smoothing on your chilled cake get a cup of HOT water and dip your spoon in it regularly. This will allow it to glide over the surface and not gouge into the cake. 1.) Preheat oven to 350F. Butter and flour 2 large bundt pans. Sift the dry ingredients (except the sugar) together and give a good whisk to mix well. 2.) Cream the butter and sugar together in a stand mixer fitted with a paddle attachment for approximately 4 minutes on medium. Add the eggs one at a time making sure each is incorporated well before adding the next. 3.) Mix the buttermilk and sour cream in a large glass or bowl and set aside. 4.) Add the flour mixture in three batches alternating with the milk mixture. Making sure you start and end with the flour mixture. Do not over-mix, just beat until combined. Scrape the bowl down when towards the end. 5.) Mix in the pumpkin puree. Scrape down the sides of the bowl and make sure the pumpkin is well incorporated. Pour batter into bundt pans. Bake for about 60 minutes or until a skewer inserted in the center comes out clean. Allow cakes to rest in pans for about 20 minutes then invert onto a wire rack to cool. 6.) For the Cream Cheese Frosting: Beat the cream cheese in a bowl until it is smooth. Add in vanilla and powdered sugar. Mix until ingredients are well-incorporated and desired consistency is reached. For the Buttercream: Beat butter until light and fluffy. Add vanilla and then slowly add sugar. Add milk a few tablespoons at a time until desired consistency is reached. If want a stiffer buttercream, use less milk. Add in the food coloring. 7.) Cut bottoms off cakes. Pipe or smear cream cheese frosting onto bottoms. Sandwich together. 8.) 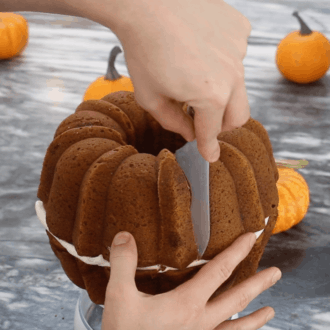 Depending on the shape bundt pan you use, you may need to contour the outside using a knife to sculpt into a pumpkin shape. 9.) Cover in orange buttercream. I used an 898 tip but you could just smear it on with a spatula instead. 10.) Us the beck of a spoon to start smoothing out the pumpkin. I like to give the cake a general smooth then Refrigerate to help the sculpting process. Otherwise the pumpkin will bee too gooey. 11.) Continue smoothing buttercream. You can add moe frosting if desired. Sometimes I’ll add a slightly lighter color to accentuate the highlights and create dimension. 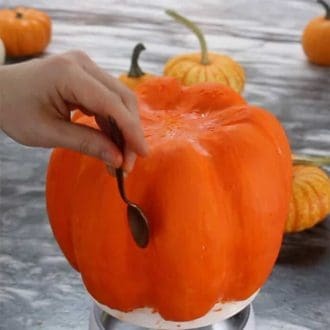 For the final smoothing chill the pumpkin and use the back of a spoon dipped in hot water. 12.) For the Stem: Mix together butter and sugar until you get a consistency that is similar to clay. Mix in green food coloring. Sculpt into a stem figure. Use a piping bag with brown food coloring to create a natural look. Add stem to the top of the pumpkin. If you’ve tried this giant pumpkin out then don’t forget to rate the recipe and let me know how you got on in the comments below, I love hearing from you! 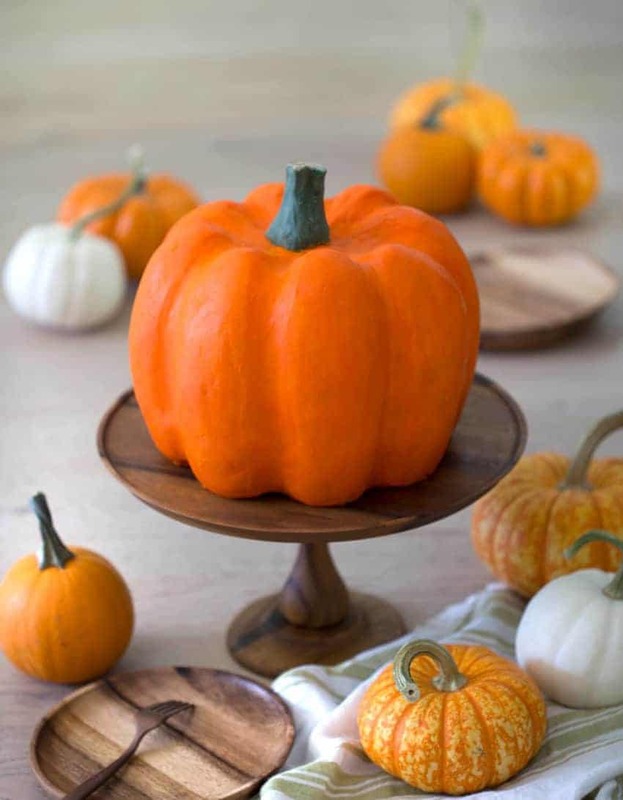 This pumpkin cake looks just like a giant pumpkin and it just might be the ultimate holiday centerpiece! 20 drops orange food coloring Depends on brand used and desired color. Butter and flour 2 large bundt pans. Mix the buttermilk and sour cream in a bowl and set aside. Add the flour mixture in three batches alternating with the milk mixture. Making sure you start and end with the flour mixture. Do not over-mix, just beat until combined. Pour batter into bundt pans. Bake for about 60 minutes or until a skewer inserted in the center comes out clean. Allow cakes to rest in pans for about 20 minutes then invert onto a wire rack to cool. Beat the cream cheese in a bowl until it is smooth. Add in vanilla and powdered sugar. Mix until ingredients are well-incorporated and desired consistency is reached. Beat butter until light and fluffy. Add vanilla and then slowly add sugar. Add milk a few tablespoons at a time until desired consistency is reached. If want a stiffer buttercream, use less milk. Add in the food coloring. Pipe or smear cream cheese frosting onto bottoms. Sandwich together. 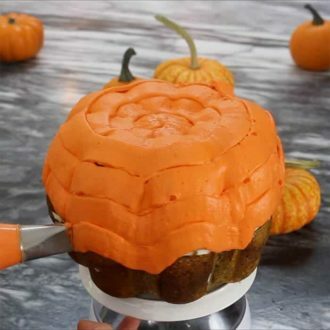 Depending on the shape bundt pan you use, you may need to contour the outside using a knife to sculpt into a pumpkin shape. Cover in orange buttercream. Refrigerate to help the sculpting process. Using a knife, smooth into ridges. Add a second layer of dark buttercream to create dimension. Smooth the buttercream. I cut a yogurt cup into a half circle-shaped tool. It's flexible and doesn't gouge the buttercream. For the final smoothing chill the pumpkin in the freezer and use the back of a spoon dipped in hot water. Mix together butter and sugar until you get a consistency that is similar to clay. Mix in green food coloring. Sculpt into a stem figure. Use a piping bag with brown food coloring to create a natural look. Add stem to the top of the pumpkin. 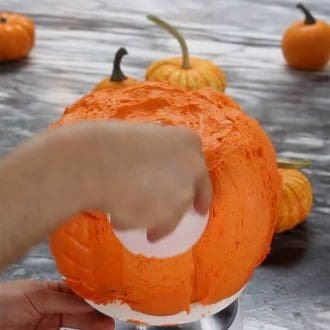 Pop it into the fridge and let it chill to harden, then add highlights or lowlights (your choice) on the pumpkin's ridges and smooth them out to blend. I have a couple of things to say about the stem. At first I tried to make one by covering an inverted cupcake in green buttercream and then sculpting. It looked OK but kind of cartoonish and out of proportion. I ended up mixing up a very thick batch of buttercream and rolling it into the desired shape then carved away at it, added some brown streaks and an off-white top the result was significantly more realistic and easier to make. Your third option is to shape one from fondant. Great way to intro into the halloween season! Wow!! This looks beautiful!!!! Can’t wait to try this out! Is it really 16 packs of cream cheese or should that be ounces? I am ready to make this recipe tonight. It’s 16 oz of cream cheese! So my pumpkin would NEVER look this good, but the recipe for this bundt cake looks delicious and very promising. Since incredible cake decorating is not in my blood, I’m thinking either a brown butter-brown sugar glaze or a cream cheese one… or maybe even a caramel drizzle? Any recommendations? This cake is work of art! I decided to make it for my niece’s first birthday as the theme was pumpkins and my word it took a lot of patience to smooth out that buttercream! But! It was so worth it in the end as it looked awesome! A real showstopper! I was so pleased with myself! So thank you for the tutorial! Question: How do you get the cake, once decorated, from one cake stand to another without hurting the cake? Do you use some sort of spatula or dough cutter/pastry scraper to move it? Just curious. One of my best friends and I both have our birthday either side of Halloween, so I’ll definitely be making at least one of these! One question though – what can I use instead of buttermilk as I can’t find any in the shops where I live? You can make your own butter milk by adding lemon juice or vinegar to regular milk. That is exactly what I do sometimes when I run out!! How are you supporting the buttercream covering the hole in the middle to support the stem? I place a cupcake in the middle made with the same batter! Amazing, turned out awesome! Thank you for the recipe– everyone loved the pumpkin cake! I’m so glad to hear your pumpkin cake turned out great and everyone enjoyed it! Happy FALL! Thank you, that is so nice to hear! Your pumpkin turned out great! I love the colors!! I made this cake for a Halloween party. All my guests absolutely loved it! They were raving about how delicious the cake and buttercream were, and they absolutely loved how realistic it looked. I didn’t have the patience to make a stem though, so I ended up cutting off a small piece of the stem from my pumpkin I bought for carving (like you did for your mini pumpkin cakes). 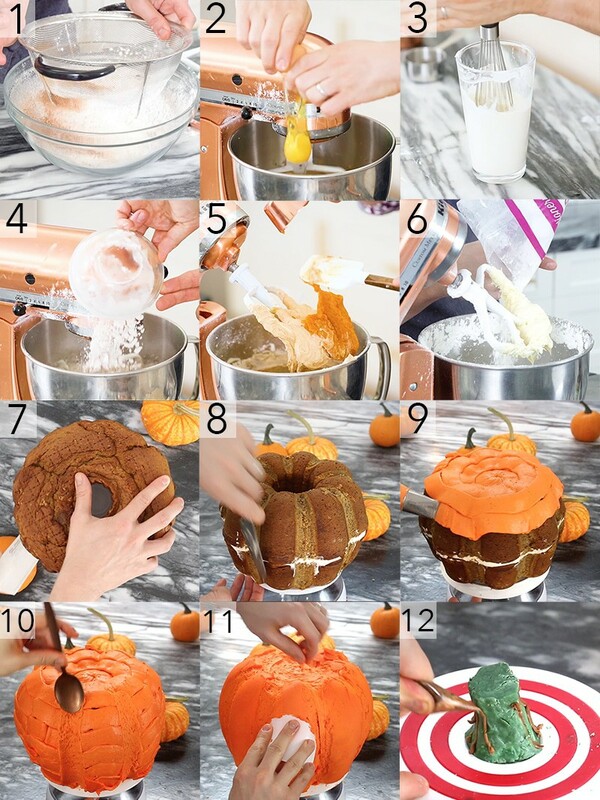 I love this pumpkin bundt cake! I’m glad you made it and everyone loved it too! Good thinking on using a real stem. I bet it looked more realistic! Thank you for your feedback!! This Pumpkin Cake was a hit at my family’s Annual Pumpkin Party last weekend! While mine was not nearly as beautiful as yours John, your instructions were so clear and concise, I felt confident regardless! I also used a real pumpkin stem and it made the cake look even more realistic 🙂 Definitely will be adding this delicious cake to my annual fall-themed baking! Thank you for an amazingly awesome blog and beyond wonderful recipes! 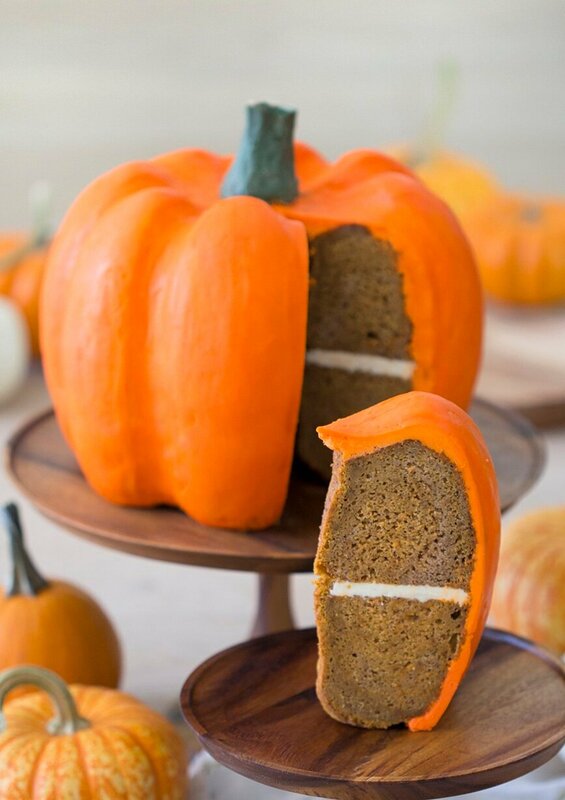 I’m so glad to hear this pumpkin cake made an appearance at your family’s pumpkin party!! It’s nice to know you enjoy Preppy Kitchen! Dear John- made this cake for our Halloween party and I filled the insides with Gummi worms and icing which spilled out when you cut it- not very preppy but a hit especially with the kids. Thank you so much for this delicious and awesome looking cake! All the best from Germany! Ps. I used Swiss buttercream instead of American and it was SO good! Hi John, I made this cake for a Halloween party and it not only tasted amazing but was a show stopper! But I have to say, I almost threw in the towel with this one. First, my icing developed tons of air bubbles from over mixing to achieve the correct orange color. It looked like…..well pretty disgusting. So I had to take globs at a time and manually smooth and push out the air bubbles on a silipat. Then I had a lot of difficulty smoothing the icing even using the cut yogurt container method as you suggested. But finally I found the trick. I used my finger dipped in warm water like you did with your mini pumpkins and gently smoothed out the icing. Using that technique worked and suddenly my hard work paid off! I used a real pumpkin stem to make it even more realistic. People could not believe it was a cake. I posted a picture on Instagram a few weeks ago and tagged you in it so you could see it. Thank you thank you for sharing your creativity and inspiring me! Keep on baking! I’m so glad all your hard work paid off and your pumpkin bundt cake turned out great!! It’s perfect for a halloween party! Well done!! Wow! It’s amazing! I’ve never seen such eatable things before!! Made this cake for my cousin’s Lil Pumpkin baby shower, and it was a big hit. Looked great and tastes delicious! People thought it was a real pumpkin! One note: The batter made *way* too much for my bundt pan, but the plus side was that I had enough extra for cupcakes that I used for the middle plus cake pops.